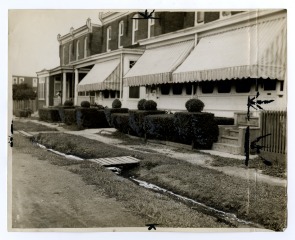 The “unhealthful, unsanitary, and unnecessary” state of the sewer and drainage system wasn’t unusual in the neighborhood of Eastwick in the 1930s. This neighborhood in Southwest Philadelphia had suffered flooding since its founding by Swedish settlers prior to 1725. The flooding was due not only to the area being surrounded by creeks and the Delaware River, but also because most of the section is below the Delaware River high tide level. Before 1854, when Eastwick was not yet a part of Philadelphia, Pennsylvania charged the owners of the swampy land with building and maintaining dikes and fined them the cost of upkeep if they failed to do so. 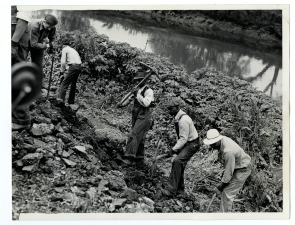 After Eastwick became a part of Philadelphia in 1854, the responsibility for maintaining dikes along the Darby and Mingo Creeks, and for installing a proper sewage system, fell to the city. While the city made limited inroads in that endeavor, the financial burden of the project led to frequent floods in Eastwick. There were open sewers, vegetation choked drainage ditches, and a generally unsuitable and unsanitary condition prevailed in the neighborhood. An unspoken positive aspect of the uncontrolled water in Eastwick was that the flooding had enriched the soil, making it an ideal place to farm, particularly before World War I. In addition, during the First World War, many working class families hailing from different nations and races and industrial concerns were able to afford land in Eastwick because property values were low due to the flooding. Nevertheless, the residents soon complained about flooding that at times even necessitated rooftop rescues of residents by police boat. One engineer argued that the dikes should be removed and that residents should be compensated for the damage to their property and then be moved elsewhere. This solution was not easy, however, as the population of Eastwick grew and residents advocated for the completion and maintenance of a proper sewage system. 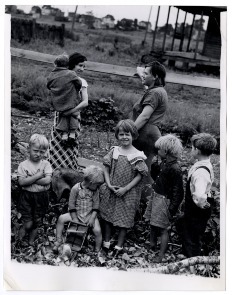 In the summer of 1931, members of the Greater Eastwick Improvement Association visited both Pennsylvania Governor Pinchot and Philadelphia City Hall to address the problem of “children…growing up, miraculously, in streets bordered by ribbons of muck and filth. Their eyes see it, their noses smell it and their clothing is smirched with it.” While the men received some promises for action, other officials argued that the cost of draining Eastwick and installing and maintaining a modern drainage system was simply too expensive. 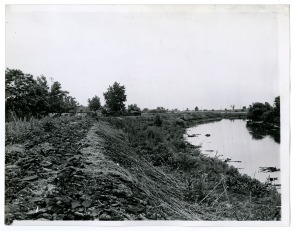 A drainage canal which was partially constructed in 1924 was, by 1931, completely choked with weeds and rotting sewage. Department of Public Works officials claimed that they were simply unable to keep up with the maintenance of the canal along with the open sewers throughout the neighborhood. While Eastwickians kept up the fight for more pleasant and sanitary living conditions, Philadelphia and federal planners were beginning to develop their ideas to make Eastwick the largest urban renewal area in the United States, with water management at the core of that ambitious idea. “Eastwick asks Drainage Relief,” Philadelphia Evening Bulletin, 13 August 1931, Urban Archives. “Eastwick’s Open Sewers Still Menace to Health; Relief Appeals Ignored,” Philadelphia Evening Bulletin, 16 August 1931, Urban Archives. “Elmwood Residents Suffer As Storm Inundates Area,” Philadelphia Tribune, 31 August 1933. “The Sunday Bulletin Salutes: Eastwick—Where 10,000 Residents Await Better Dikes, Drainage,” Philadelphia Evening Bulletin, 8 April 1951, Urban Archives.